Sophomore guard Trumae Lucas scored a career-high 15 points Wednesday as one of three Gators in double-figure scoring to lead her team to an 80-54 win against instate foe Jacksonville in the Stephen C. O’Connell Center. The victory was head coach Amanda Butler’s 50th at the helm of her alma mater. The Gators (7-6), who won back-to-back games for just the second time this season, shot a sizzling 54.5 percent (30-of-55) from the floor. Florida’s defense proved to be a difference-maker for the second consecutive game, as the Gators limited Jacksonville to 26.5 percent (18-of-68) shooting from the field and induced the Dolphins into 21 turnovers. Florida topped the 80-point plateau for the third time this season and is 3-0 in 2009 when tallying 80 or more points. 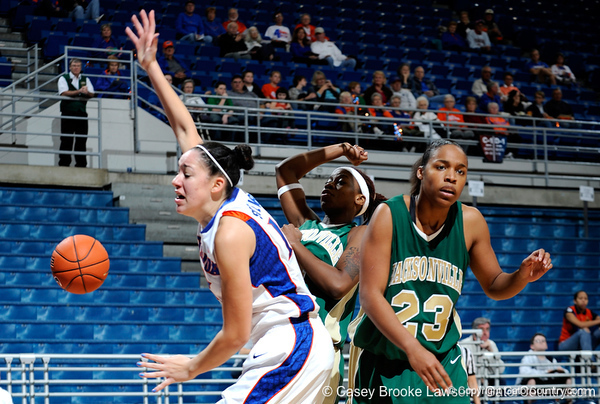 Defensively, JU’s 54 points marked the fifth time this season the Gators have held their opponents under 55. Lucas’ 15 points bested her previous career high of 14 achieved last season versus Kentucky. She connected on 7-of-7 shots from the free-throw line and also tied her career high with five assists. Senior forward Sharielle Smith turned in her sixth career double-double and her third this season with 11 points and a career-high-tying 13 rebounds to go with a season-high three steals. Freshman center Jennifer George added 15 points on 7-of-8 shooting to complement five rebounds and blocked a career-high four shots. Senior guard Lonnika Thompson, who has been one of the key sparks in Florida’s increased defensive intensity, tied a career high with eight assists. Senior guard Steffi Sorensen added eight points, including two 3-pointers. Sophomore center Azania Stewart had seven points and blocked two shots. Jacksonville (1-9), which has now dropped seven consecutive games, was led by senior guard Courtney Jackson’s game-high 18 points. Florida returns to action on Sunday, Jan. 3, when it opens Southeastern Conference play at Arkansas (8-5, 0-0 SEC). Tip-off in Bud Walton Arena is slated for 3 p.m.